Chambers of Inspiration, Vol. 3 features innovative programs, events, and ideas that challenge the status quo. Receiving 2nd Place in the Chamber Innovation Awards and featured in the latest volume of the book is the LAX Coastal Chamber of Commerce in Los Angeles, CA. The LAX Coastal Chamber recognized that today’s business community is changing. Modern professionals can work anywhere in the world with just a laptop and a cellphone, and many of them are unfamiliar with the chamber of commerce model. To prove themselves as a resource for this “new” worker, the chamber introduced LAX Coworking, a workspace with supplemental educational resources and programs for professionals on a tight budget. LAX Coworking aims to provide a positive, productive, and collaborative work environment by elevating small businesses and entrepreneurs in the area. 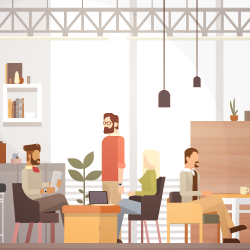 They provide a physical space for startups at a competitive rate, which allows innovators to have the resources of an office without having to sign an expensive lease, as well as the community of a corporation while still working for themselves. Chamber members are also invited to use the coworking space — from hosting board meetings to using a desk for the day, any and all are invited. The chamber knows that when an organization focuses on its members’ needs, it receives rewards tenfold. When an LAX Coworker establishes a new business through the support of their local chamber, it builds a loyalty that will last. “Within today’s changing business climate, the ways of the traditional brick-and-mortar business are fleeting. The new professional is mobile, often working a schedule outside of 9 to 5. As the LAX Coastal Chamber, we were excited to reinvent ourselves to better help this new type of worker, all while still offering the same great Chamber of Commerce service,” shared Christina Davis, President/CEO of the LAX Coastal Chamber of Commerce. Download Chambers of Inspiration Idea Book, Vol. 3 today.